Kitchen cabinets are arguably the most visible furniture in the kitchen. Your kitchen decor will largely revolve around what they look like. Since they require so little enhancement – mostly painting – it’s worth knowing how to choose kitchen cabinet colors. Here are some things to keep in mind before deciding what color your kitchen cabinet will be painted in. This is an easy way to decide what color to use. For a traditional kitchen, you can’t go wrong using classic colors like white and creams. Even arts and crafts style kitchens will look wonderful in subdued creams and bright white colors. The more modern your kitchen is, the greater your palette options are. Everything from bright colors (yellow, red, green) to contrasting tones will look great. The smaller your kitchen is the fewer color options your cabinet have (stick to light colors like white). The reason is simple. Dark colors, especially in unlit rooms, tend to shrink whatever space they’re in, which is the last thing you want in your already small kitchen. Try to incorporate bright and light colors in your kitchen. Whether you see yourself staying in your home for some time, or you’re renovating for the sole purpose of selling immediately, you’ll want to keep your colors neutral. Using neutral colors in your kitchen will appeal to a wider audience. This is simple when selecting your kitchen cabinet colors. Depending on how well lit your kitchen is, you can contrast black and white throughout. Other shades that work just as well include other dark shades like grays and deep browns. If you’re still undecided about what colors to use, try multiple colors. If you want to play it safe, paint your kitchen with one bold color, then use a neutral shade on the cabinet. If you’re a bit more artistic, white kitchen walls paired with multiple colors on the cabinet will look fabulous. Remember to use colors that pair well, and do not distract from the rest of the kitchen. Some cabinets look naturally beautiful – even without any paint. If you don’t want to cover up all that natural beauty, consider staining your cabinets in the desired shade instead. It will preserve the beauty of the wood without compromising on your kitchen’s decor and style. Want something a little less common, then use different shades of the same color for your cabinets (and other parts of your kitchen). If you want to create contrast but don’t like white, try using dark brown on the cabinets, and lighter shades of brown, perhaps tan, on the walls. 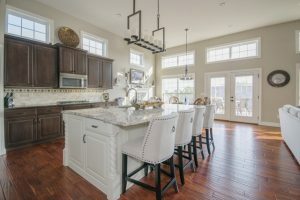 Regardless of whether you’re just renovating, or building your home from scratch, knowing how to choose kitchen cabinet colors determines what the final look ends up being. This is especially important as it will determine whether you’ll need to apply a fresh coat often or not.